Tucked in the mountains and just outside Sedona is the site where cliff dwellers once lived known as Montezuma’s Castle. The five story dwelling is remarkably well preserved and built in the 12th century by the Sinagua people. They cleverly wedged their lodgings in the rock, high above Oak Creek, which runs through the red rocks of Sedona. 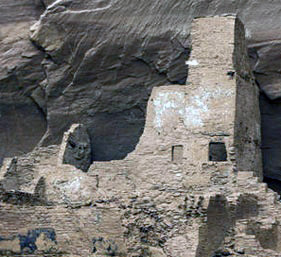 Historians can only speculate that they build so high because the spot offered protection from the desert elements. The Sinagua lived in their rock high-rise for over 400 years before disappearing mysteriously. Another group of Sinagua people established their own community called Tuzigoot. These ruins are located 20 miles from Montezuma’s Castle and built from the natural resources found in the surrounding desert. With all their clever building techniques, the mystery still remains why the Sinagua suddenly disappeared in the 1400’s. Some feel that they may have used up their natural resources or maybe a plague or disease wiped them out, but since there is no written record, no one knows. My hubby and I are spending our 30th wedding anniversary in Sedona next month. While there, we plan to spend one of our days in Jerome. We also plan to visit Montezuma's Castle, Tuzigoot and the petroglyphs that are all over the rocks of Sedona. I will have lots of pictures and more information on this mysterious group of people known as the Sinagua. Our globes unsolved mysteries. I love em. Can't wait for the photos. Hope you two have a great time. That is going to be the best anniversary trip! You know me, I get all excited about adventures and seeking knowledge and going to unexplained places. Some day, I hope to be able to share that with a guy. I can't imagine how wonderful that would be. I know you'll have a blast and I cannot wait for the pics! Jeez, what is blogger doing to my text? It doesn't look right on my end. MM; I love the history on all the Native Americans that lived here way before the first settlers arrived. I will take lots of pictures. Sis; We are looking forward to this vacation. I am glad that my hubby wants to got to the ruins and spend a day in Jerome. We are staying in a cabin right along Oak Creek river. That is going to be so sweet.